A-HOTEL.com - Luxury and cheap accommodation in Ashe, Russia. Prices and hotel, apartment booking in Ashe and surrounding. This indicative offer was derived from the most recently booked accommodation in Ashe and sort by the price, from cheapest Ashe accommodation to the most expensive hotels. To select accommodation by your preferences we recommend to choose from 7 accommodation offers in Ashe in total. By entering the dates of your overnight stay in Ashe and using the filter tools you can sort the best possible accommodation for you. The entered dates of your stay are crucial for the most accurate offer as it derives all the online information on pricing and availability of Ashe accommodation. Then you can book the selected Ashe lodging (hotels, apartments etc.) immediately. Guest House Avesta is located in Ashe and features barbecue facilities. All rooms boast a flat-screen TV with cable channels and a private bathroom. 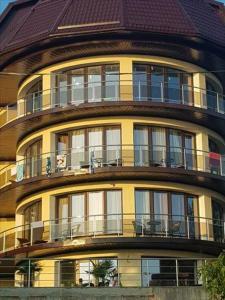 Built in 2013, Riviera Gostevoy Dvor is located on the Ashe River in Krasnodar Krai. The hotel provides an outdoor swimming pool and sun terrace. Set in Ashe, Zvezda Guest house features barbecue facilities and terrace. Certain units at the property have a balcony with a sea view. Situated in Ashe, Pansionat Kosmos has a garden, terrace and free WiFi. Staff on site can arrange a shuttle service. With a garden and a terrace, Camping Kosmos provides accommodation with free WiFi. A balcony with mountain views is offered in each unit. Guest House Ostrov has a garden, terrace and shared lounge in Ashe. All rooms feature a kitchen and a shared bathroom. Boasting a terrace, Avgusta Guest House is situated in Lazarevskoye and is 10 km from Aqua Park Sea Star. 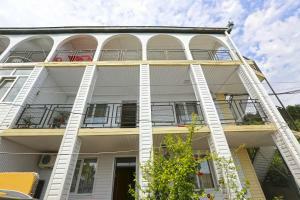 The property is around 11 km from Amusement Park and 12 km from Aqua Park Nautilus. Guest house on Skryabino is located in Tikhonovka. Boasting free shuttle service, this property also provides guests with a barbecue.